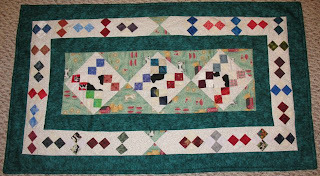 Pattern: This was adapted from Australian Country Threads Pg 42 - 1st Edition Collector's Edition. Reason: A thank you gift for being care group leaders for five years. They were dairy farmers so I knew a cow theme was in order. Lessons Learned: Stuff cut on the bias is stretchy. My Aunt taught me some triangle logic. Thoughts: A class in triangles would be a good thing. Learning how to keep a decent deadline: Also a good thing. This took almost two years to complete.